You decide to learn a skill, say programming, and buy the best book you know about it. After finishing the book and doing some exercises, you feel like you’ve mastered programming. Say your ability to program has reached from level 0 to level 3. You feel like a pro and add ‘programming’ to your resume under the ‘advanced skills’ section. You even rank yourself among the best programmers in the world. The less competent a person is the more they overestimate their competence. On the contrary, the more competent people have a tendency to underestimate their competence. The researchers tested students on a series of criteria such as logic and grammar. They then compared the actual test results with each student’s own estimation of their performance. Interestingly, the study was inspired by a stupid bank robber who covered his face with lemon juice thinking he wouldn’t be caught because lemon juice made things invisible. He figured that if lemon juice is used as “invisible ink” then perhaps it could make him invisible too. In other words, to know that you’re not competent enough you have to know that your present skill level is way below the level you can reach. But you can’t know that since you’re unaware of the levels you can actually reach. So you think your current level is the highest you can reach. If all this sounds confusing then go back to the ‘programming’ example. On reaching level 3 you think you’re a programming pro but there’s a programmer out there somewhere who’s reached level 10 and is laughing at your pride. Of course, you had no idea about your incompetence at level 3 because you had no idea that higher levels existed and therefore you assumed that your current level is the highest level. What happens when, still at level 3, you come across information that could raise your skill level in programming? Say, for example, you come across a new programming book in a bookstore. At this point, one of two things can happen. You can either dismiss the idea that there could possibly be more to know or you could plunge into the book right away and raise your skill level in the field of programming. That last point is exactly what separates a genius from an amateur, wise from the fool, and intelligent from the stupid. When confronted with new information, the less competent tend to not learn from it and remain less competent. The more competent realize that there’s no end to learning and therefore are constantly learning and raising their competence levels. The fact that they were already competent before encountering new information in a given situation proves that they had an attitude of learning from the start when they weren’t as competent as they are now. Why don’t the less competent learn from new information and become more competent? Well, in order to do that they’d need to drop the idea that they’re a pro and this hurts the ego. It’s much easier to continue to fool yourself into thinking that you’re the best than confront the reality of your ignorance. It’s all about maintaining your perceived superiority. 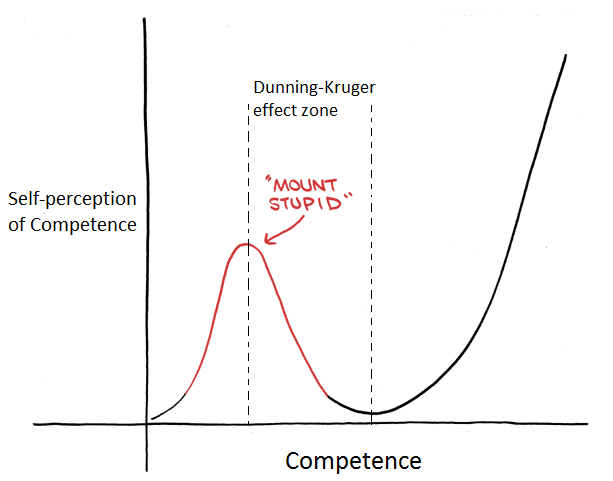 In fact, the Dunning-Kruger effect is a specific case of illusory superiority bias- a tendency in people to overestimate their good points in comparison to others while simultaneously underestimating their negative points. Laziness could be another factor. 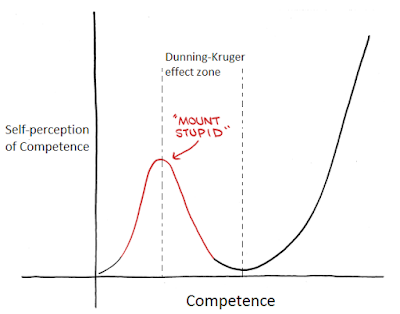 Learning is hard and most people would rather not put in the effort required to raise their competence levels. This way, not only do they avoid the hard work but at the same time keep stroking their ego with the delusion that they’re highly competent. 1. Kruger, J., & Dunning, D. (1999). Unskilled and unaware of it: how difficulties in recognizing one's own incompetence lead to inflated self-assessments. Journal of personality and social psychology, 77(6), 1121. 2. Ehrlinger, J., Johnson, K., Banner, M., Dunning, D., & Kruger, J. (2008). Why the unskilled are unaware: Further explorations of (absent) self-insight among the incompetent. Organizational behavior and human decision processes, 105(1), 98-121.